I'm kind of on the fence about bolting on the motor. I'm taking a little time to consider Chris' points on tongue weight & trailering. For now, I'll just plan on another backache for my next trip to the lake! With the work on the bilge pump finished, I declare Perseverance DONE. Here are some photos from the lake today. Once I get some better shots, I'll post something in the "Launching Ramp." Well done! Ready to see her next month! I'm sure ready to see mine done also. Very nice Mike and congratulations. I can imagine it feels really good to have completed this after all the things you've gone through getting to this point. She looks beautiful. Nice work!! Looks great! !! Have many hours of fun. Really fine job Michael. Cant wait to see it. I really think this design should be more popular. Its such a simple, fun boat. Sweet - Nice job and thanks for all the hints and suggestions your posts provided me with my Utility build. I will have mine out of the basement soon - Just finishing the Bilco Door entrance. I know its only 8 horsepower, but I would bolt it on for sure. By the way your boat looks awesome! I love the way it has come together. I think that wiring is about as neat as it can be in an open boat without any places to hide it. The decal that you got for the name is really classy. Thank you, Matt and everyone! I took it back to the lake yesterday, with intermittent winds that quickly blew up some pretty good chop... though not quite as much as the first time I had it out this summer (THAT was just plain nerve-racking). Yesterday we got showered pretty good with spray coming over the deck, but it was actually kind of fun. The Utility is definitely not a rough-water boat, but the more I get used to it, the more I'm learning to trust it. 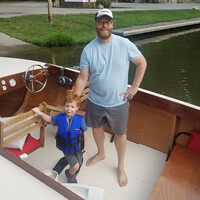 After some trim adjustments, I'm still finding that the little 8hp motor is a little underpowered for both me and my son. It does better with me and my daughter, and will plane. However, going into a headwind, you might as well forget wide-open throttle. With just me in the boat, the 8hp is great. I'm starting to consider a different prop. What's on it now is a 3-blade prop that is probably 7" pitch (I haven't taken it off to look for a stamp yet)... standard Tohatsu/Nissan equipment for that motor. I've seen 3-blade, 6" pitch props available... as well as a 4-blade 7" pitch. I'm thinking of trying the 4-blade prop first to see if it will provide enough added thrust to get on plane with both me and my son aboard. Any thoughts on props? I talked with Tony at HB and he said you were out. All boats have their limits. But, from what I've seen the utility does pretty good for it's size! Michael. I think youll get used to it. The little Utility I had would take about the same conditions as my Zip, which really isnt alot. If the wind is causing white caps, it stops being fun for either boat. A good headwind chop definitely makes for a rougher ride but dont worry, the boat can take more than your rear end can. As for the prop, definitely find out what you have. My 8hp 2 stroke and the 15hp four stroke both came with 9x9 props. That worked great for heavier loads but with just me I would over rev so I bought one size up too. I think that was a 9x10. vupilot wrote: As for the prop, definitely find out what you have. My 8hp 2 stroke and the 15hp four stroke both came with 9x9 props. That worked great for heavier loads but with just me I would over rev so I bought one size up too. I think that was a 9x10. I did the spring maintenance on my motor this weekend. I was anxious to remove the prop to see what markings might be on it. The one and only marking was on one of the blades, and was simply "F7." My motor is a Nissan 8hp 4-stroke, which is made by Tohatsu. Apparently Tohatsu is no longer marketing motors under the "Nissan Marine" brand, so I looked around online for info on Tohatsu props. A chart on their website shows an 8.9" diameter, 7" pitch prop as the only standard equipment on their 8hp 4-stroke. So, in all probability... that's what I've got. So, the big question is whether or not the 4-blade, 7" pitch prop would provide enough added thrust to plane the boat with my boy and me? Or, would the 3-blade, 6" pitch be more effective? I would stick with a 3 blade. Fewer blades are actually most efficient. In theory the 6 pitch will be slower than the 7 pitch at same rpm but because we found in your testing you are not getting max rpm with the weight of two aboard the 1" lower pitch should increase your rpm by about 300 rpm to where you are making some more power. If I remember right you were getting about 4800 rpm with two aboard and 5600 rpm solo. Problem is then you have to change props again running solo or youll be over- revving. And the experiment costs a pricey prop, but I think you are on the right track going down an inch for two aboard.